There are available yachts in above chosen reservation period. There are no currently available yachts in chosen reservation period. 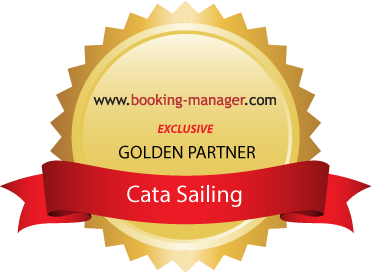 Luxury yacht charter Croatia offered by the Cata sailing d.o.o is your ideal choice if you have a passion for sailing in Croatia and seek professional, personalized and highest level service. We are a team of enthusiastic, experienced and trained charter professionals with a goal to provide supreme level of service to our clients and partners.Our fleet of carefully selected catamarans and sailing boats allows you to experience ultimate privacy, control and freedom while discovering Croatian coast by boat. We specially took care our yachts have extensive equipment as well as high safety, navigation and comfort standards. Peculiar attention is devoted to boat maintenance, impeccable cleanliness and technical performances of our boats. SCT Marina Trogir, a first-class marina, is setting new standards by offering complete top-notch quality services for all types of vessels which is why we’ve chosen it for our fleet base. Our fleet of carefully selected catamarans and sailing boats allows you to experience ultimate privacy, control and freedom while discovering Croatian coast. We have prepared for you a few cruising route suggestions, for a 7 and 14 days sailing period, that allows you to fully discover Croatia. Dubrovnik is one of the world's most stunning destinations, both in terms of its cultural heritage and as a sailing destination. Let your dreams set sail... enjoy an unforgettable journey! From the initial interaction via email for planning our destinations, Teo was extremely helpful in helping ensure we didn’t try to do too much or miss any of the most memorable locations. We sent him a list of destination and he provided great feedback on what would be reasonable given the length of our trip. He was very articulate in explaining the trade-offs in terms of time spent sailing to the destination vs time spent at an island enjoying the beautifully warm waters and culture of the village/city. We arrived with a tentative itinerary but planned each day every morning as there was a dependency on the weather and winds. Teo was a very clear communicator in helping us make the best decisions each day by explaining the weather, wind and time required to sail. He was very accommodating in every way to ensure we enjoyed our trip and saw many of the places we had listed. We cannot express enough gratitude and appreciation to both Teo and Zeljana as they answered our many questions about Croatia from the topography, geography, to the history and culture. They were so friendly, accommodating and instrumental in ensuring we had a memorable trip and extremely positive experience. They arranged wine tasting trips, biking trips, restaurant recommendations and reservations, massage appointments, shipping estimates, postcard stamps and mailing, souvenir recommendations, pick-up and drop off arrangements to/from the airport, transport on each island, etc. They couldn’t have been more helpful and thoughtful! They are extremely hard working and dedicated! Cette nouvelle organisation à 3 membres d’équipage fonctionne très bien ; chacun parfaitement dans son rôle ; Ivana toujours aussi gentille et plus à la cuisine (excellente), Maya à l’entretien du bateau, très bonne à la manœuvre et adorable avec les enfants , et Davor skipper Hyper pro et avec le sourire , bref un super moment que je vais essayer de renouveler en 2017 sur la partie Nord de la Croatie (Losinj à Split par exemple), avec le même équipage. Encore Merci pour tout ! Катамаран был в хорошем состоянии. Сотрудники чартерной компании быстро реагировали на всякого рода запросы. Since this was our first charter, we weren’t sure what to expect. However we were pleasantly surprised. The skipper took us to some special places, being a local he knew some beautiful secret spots. There were 3 children on board, all of them loved the boat and crew who were entertaining and accommodating to their needs. The hostess not only cooked delicious meals but she also looked after the daily cleaning and upkeep of the boat, along with the skipper. We would highly recommend the boat with skipper and hostess-the experience of the places visited as well as the warmth and professionalism of the crew, exceeded our expectations. I can’t say enough positive things about our experience with Captain Neven and his crew ( his daughter Julija) over the past week on our charter of Bright Star. Besides the fact that the catamaran was an incredibly comfortable way for the 5 of us to travel, the small coves and popular and less well known of our middle Dalmatian coast cruising destinations were just wonderful. A bigger boat wouldn’t have been as able to get away from the tourists as well for one thing ,but Neven was also genius at predicting what we would enjoy seeing and doing. One of the biggest added values that this crew gave us was our captains experience, insights and interpretations of Croatian history and modern day politics. He has a front row seat from his ‘ real’ job as a long time officer in the Croatian Navy. Julija’s cooking was incredible and she was also generous with her insights into life as a university student ( which she is). This was especially interesting for two out of three of our kids who are headed to US Colleges next year. We all agreed this was our best family vacation ever – because the Dalmatian coast is gorgeous, the Bright Star was in beautiful condition, we had a couple of days of nice winds and because Neven seemingly knows everyone on every island who could possibly enhance our experience.